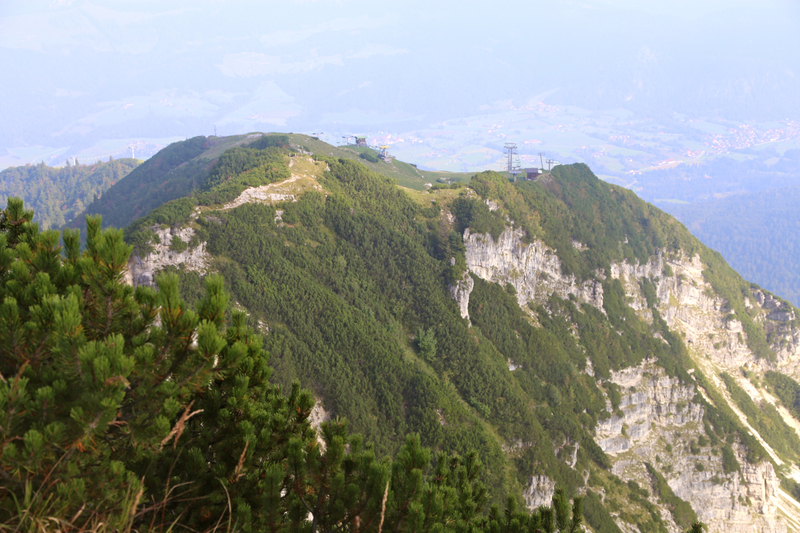 This mountain can be accessed via a "seilbahn", that is a gondola cable-way. In summer, this service starts at 0930, the cost for a round-trip ticket in 2016 was slightly less than 20 Euro. The base / parking is located in the small town of Kössen. Kössen is close to Germany. If you drive from Munich towards Innsbruck, then exit towards Kössen about 20 kilometer after the authobahn fork where E-52 runs east to Salzburg. The road you should take is Hwy. 172. The drive to Kössen on Hwy. 172 is about 20 kilometer. 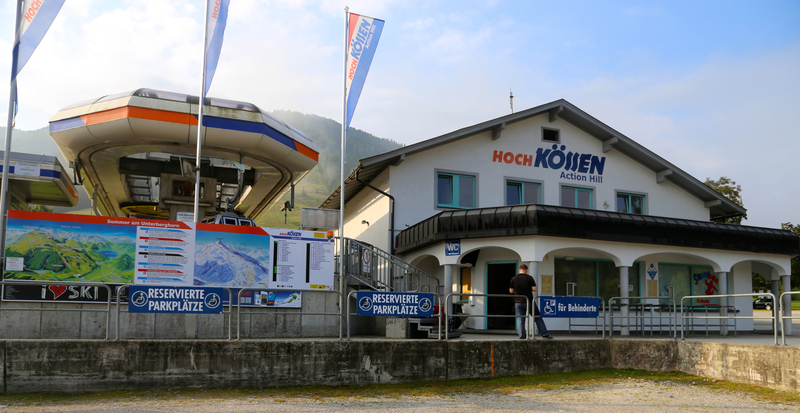 When you enter Kössen, then look for signs to the Hoch Kössen Bergbahn, turn right and follow the small road to the parking area. This location is N47.65356, E012.42088, elevation about 615 meter. From the exit, a nice dirt road curves up along the hill to the highest chairlift. 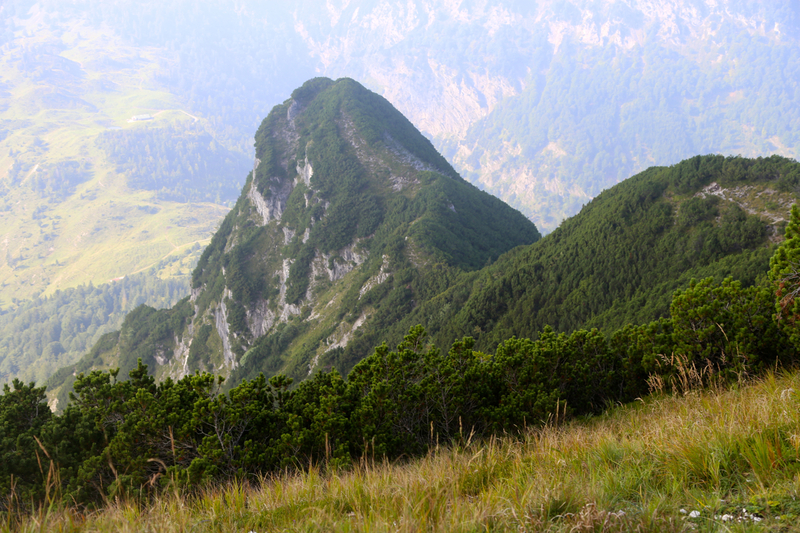 From here, a good trail follows the top ridge. The ridge narrows at one point, but the path is still broad, then climbs a short metal staircase. 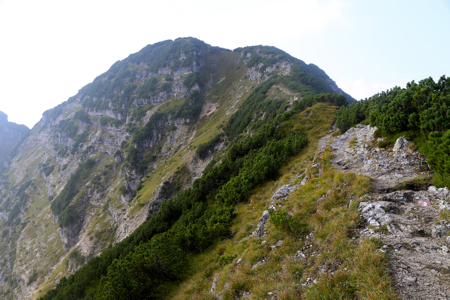 The peak has quite a steep side on the left side as you ascend the easy ridge. 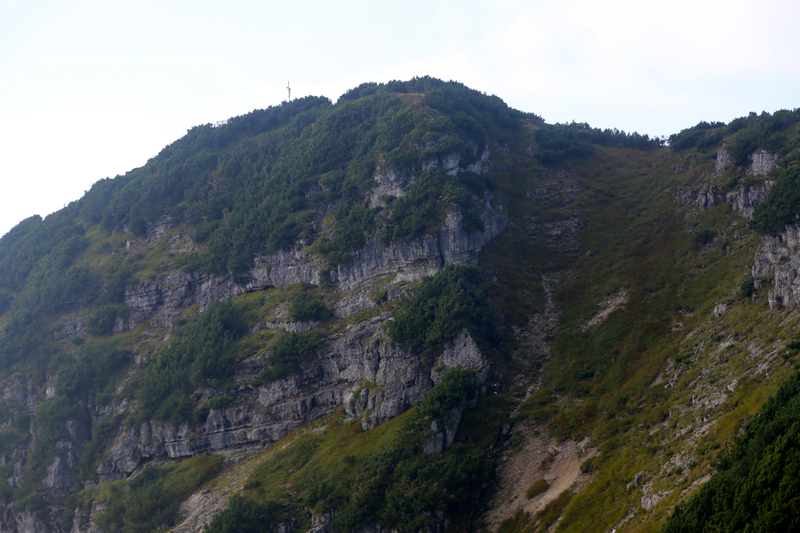 A short distance remains before one arrives at the summit cross. 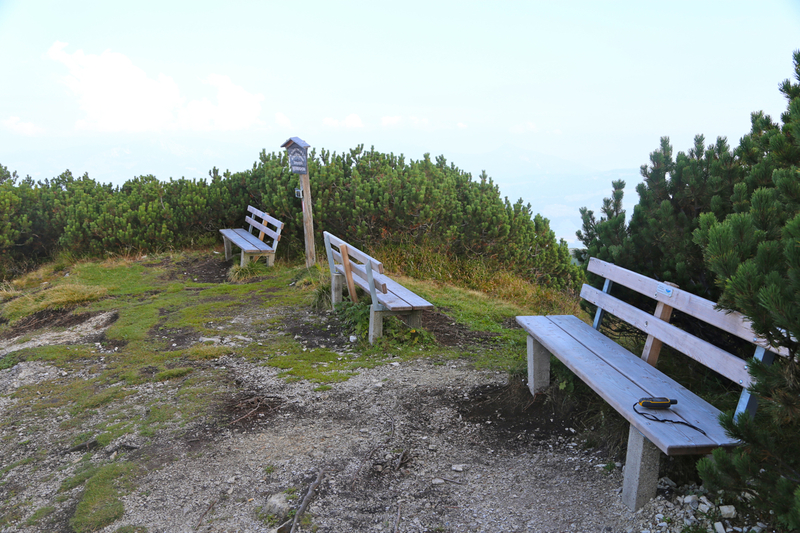 There are several benches for people to sit and enjoy the view. This hike is nice, but very short and very easy. I had my flight back to Norway from Munich and after a nice breakfast at my B&B place in Unken, I drove to Kössen. Since this is the end of the German vacation, I expected quite a few "stau" on the authobahn and needed to safeguard time in order to catch my flight in Munich. Thus, a short hike was in order. The lady at the ticket window first suggested that I certainly had a card from one of the local hotels, that would entitle me to a discount. When my answer was negative, she suggested that I might be more than 60 years old? This time success and she was happy to offer me a 2 Euro discount. I got one of the very first gondolas (small 6 person cabins), and started hiking at 0945. 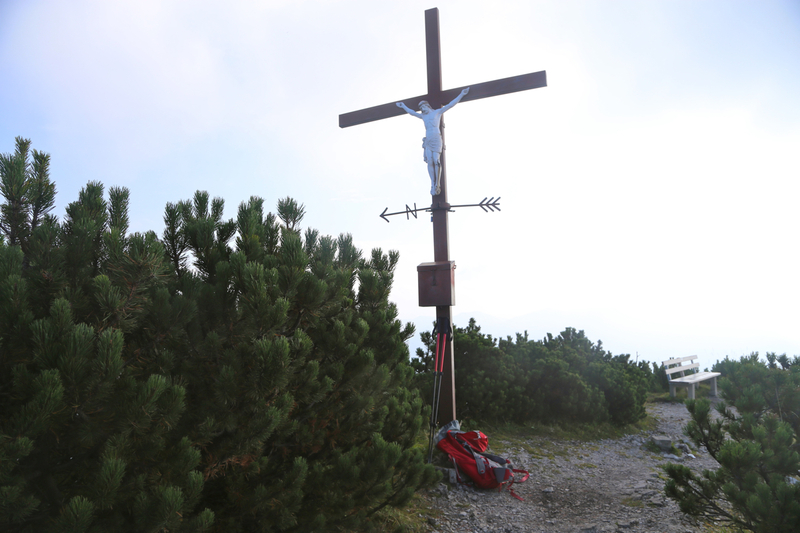 The hike was straightforward and short, I arrived at the summit cross after 30 minutes. It was a nice day and I had no hurry. I sat on one of the many summit benches and looked at the haze that provided less than perfect views. After 30 minutes it was time to descend. The hike back down took 25 minutes. then a ride back down. The entire trip from my car and back took 2 hours. I then drove to Munich, the checkin counter suggested that I fly to Oslo instead of Bergen, with a good chance of being home by 2000. Good service! Top of the ski area, as seen from the summit.